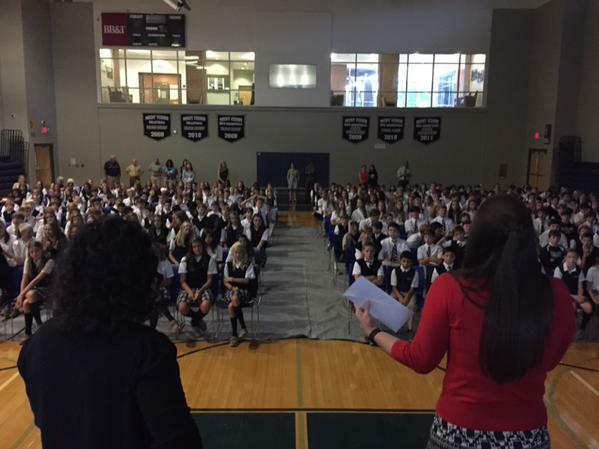 A crowd of over 350 students and teachers cheered and watched in awe as the DJI Phantom 3 drone was unleashed on middle school during chapel announcements. The drone is the newest piece of interactive technology to be purchased for student and teacher learning. While many fascinating learning opportunities exist with such tech (students will learn to fly, as well as design new uses and explore ethical decision making in current events), our drone has become a vehicle for introducing another emerging technology: digital badging. Unleash the drone! As a way to expand the learning measures, Mrs. Wilkes and Mrs. Levinson spent the summer researching, designing, and planning how to launch badging with our faculty. In pre-planning, our teachers earned over 60 badges (the Drone Flying Ace) is only one of many exciting new badges that Mount Vernon faculty can earn. Our IT Director Mikey Canup has been awesome at not only supporting our ideas, but helping us implement them! Even when we crashed the drone outside a few weeks ago (two propellors broke in half), he smiled like a forgiving father. 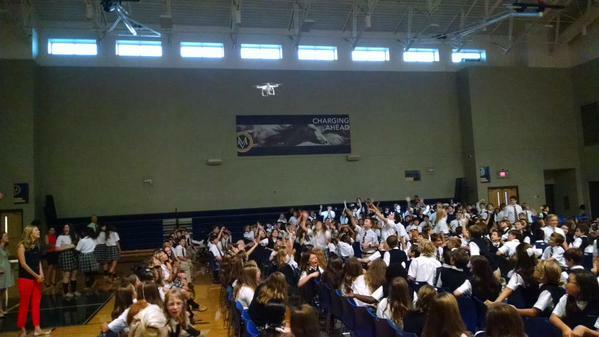 The DJI Phantom 3 flies overhead at Middle School at chapel during announcements. 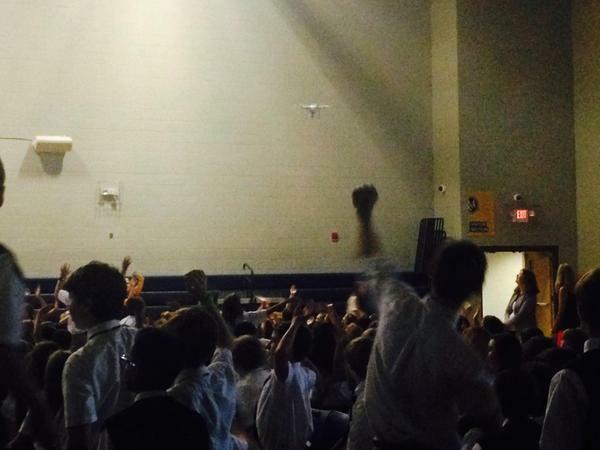 The crowd cheers wildly as the newest member of the Middle School community is unleashed – the Drone! Mr. Townsend is thrilled to receive a physical sticker badge to match his digital “Drone Flying Ace” badge! Although many of the faculty have already received their earned badges via an electronic file, today we recognized those who earned the Drone Flying Ace badge with a secondary, physical sticker to match the digital badge. 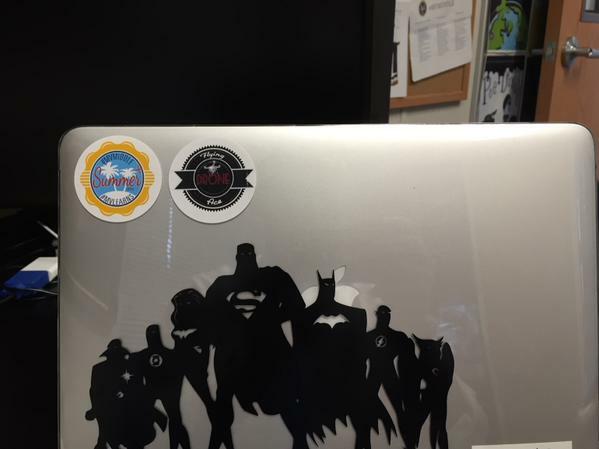 The sticker can be posted anywhere (mine are on the clear, plastic case protecting my laptop) to display and share new knowledge and skills you have demonstrated. Other badges include demonstrations such as operating a Clear Touch, presenting at a conference, blogging, designing formative assessments, and others. Mrs. Wilkes and Mrs. Levinson have done the heavy lifting to introduce badging to our faculty. We are exploring ways to expand the learning measures beyond a single, numerical grade. Will it catch on with students? Two physical sticker badges affixed to my computer cover that match their digital counterparts (posted on Haiku, personal blogs, and Credly). They fit nicely next to the DC super heroes – that’s what our team is – a legion of super heroes with incredible powers! Featured on Mount Vernon’s News Site! 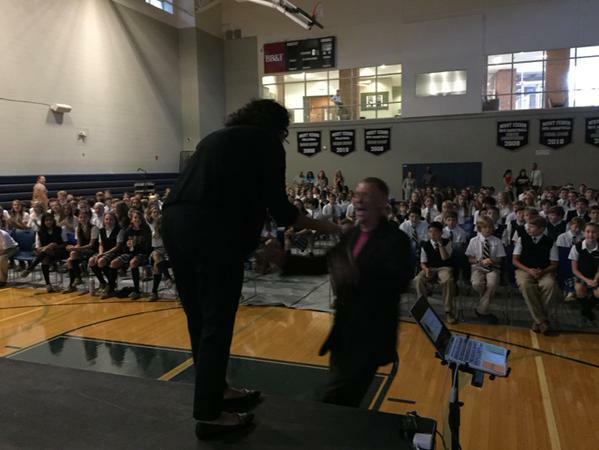 What a great recap of the the pre-chapel festivities! The crowd was indeed excited. I think awarding badges to teachers in front of students is the perfect way to not only get them excited but to see how much the school values badging. Mrs Wlikes and Mrs. Levinson have done a wonderful job and I know they have worked very hard. They continue to work hard, even reaching out to me to nudge me to apply for the drone budge I had already earned but for which I had failed to submit the request. It was also nice to see how many badges I already had from the past few years from things like being a coach at FUSE the past 2 summers. That was a nice surprise since I had not looked at my account. Thanks for the post!